This PBX outputs SMDR data via IP. 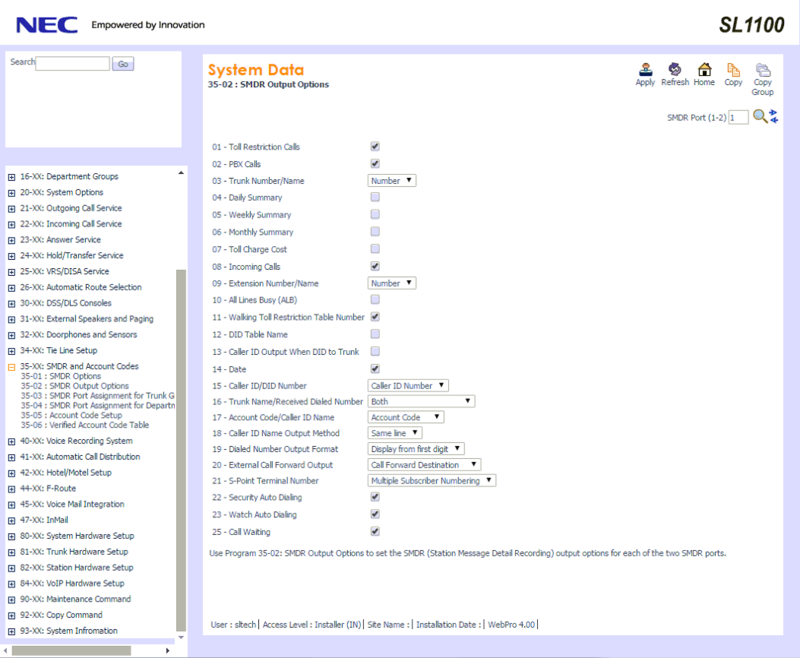 Here are the items you need to do to get the SMDR output from SL1000 or SL1100 CPU. 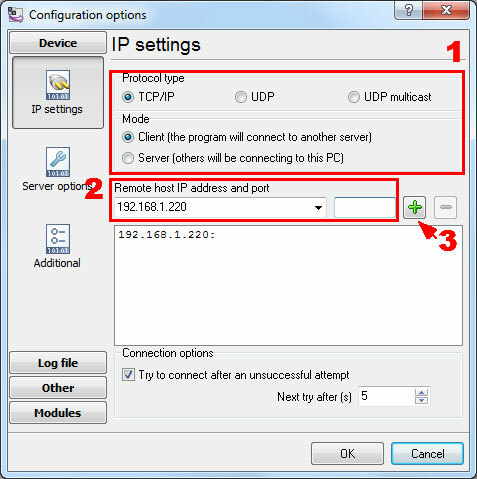 PROG 10-12-01 and 10-12-02: confirm your IP address given for the CPU. It should be the static IP address. 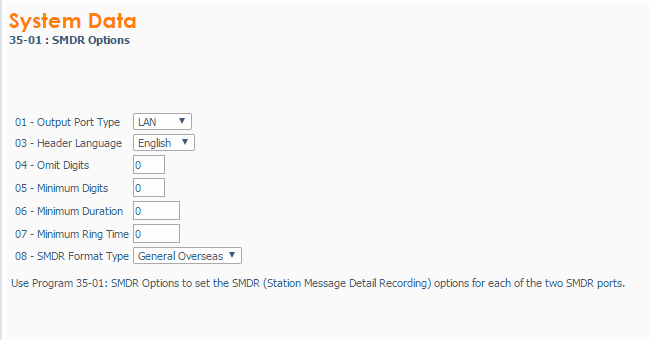 PROG 35-01-01 (Output Port Type): select "LAN"
PROG 35-01-08 (SMDR Format Type): select "General Overseas"
PROG 35-02-15 (Caller ID/DDI Number): select "Caller ID"
PROG 35-02-16 (Trunk Name/Received Dialled Number): select "Both"
PROG 35-02-17 (Account Code/Caller ID Name): select "Account Code"
PROG 35-02-18 (Caller ID Name Output Method): select "Same Line"
PROG 35-02-19 (Dialled Number Output Format): select "Display from first digit"
PROG 35-02-20 (External Call Forward Output): select "Call Forward Destination"
You can easily change the setting above using the WebPro interface. Login using the installer name and password (by default: sltech/12345678). Our software should work in the TCP client mode. It means that our software will initiate connection with the PBX and the PBX will work as a server. 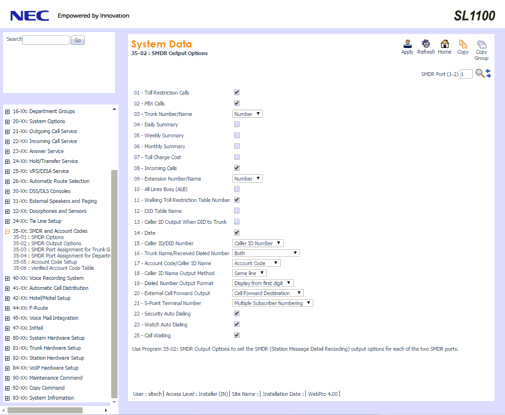 Add one or several PBX IP addresses here (the IP address of the SL1000 or SL1100 CPU). The port number should match the port that you have defined within the PBX (60010 in the example below).